Followed by or actually in addition to the ongoing Pugnacious Penguin Army ’11 (PPA) project the idea to make an exclusive army of white penguin soldiers was born after Eric Nilla (fellow collector and well skilled artist, mold/cast maker) launched some awesome custom and non original Gumball figures in 2012. Although the Beastformers Team is always a bit skeptical when it comes to the reproduction of original items there cannot be much harm done to the original line here since the Penguin, a Serie 3 figure, was never produced as a Gumball. The actual plan was to add a limited amount of 12 Gumball Penguins to the PPA and 3 more were added to end up at a total amount of 15 Exclusive Gumball penguins. So far all the gumballs made by Mr. Nilla came with weapons in the same white color as the Gumballs a nice gimmick but this time an extra touch was wanted and there was decided to give these little White Soldiers a purple spear just like the original figures had. The Spear is the weapon that belongs to the Penguin but it is so delicate that it has become a hard to find item over the years so providing these little Gumballs with a gumball purple spear made them complete. It is actually this Purple weapon that comes with the figures that makes them the limited edition since this idea is exclusively for the Beastformers Gumball Penguin release! Purchase Information: When you are planning to order a figure please keep in mind all inquiries send during the release are based upon First Come First Served principle which means that eventhough you have submitted your order just seconds after 8 PM -UTC- time on Saturday, October 19, 2013 it is possible someone was just a few seconds quicker. ALL ORDERS RECEIVED BEFORE THE EXACT RELEASE TIME WILL BE AUTOMATICALLY REJECTED AND WILL NOT BE PROCESSED! The moment you do receive and email confirmation concering a succesfull order you will be requested to pay within the next 24hrs. or your order will be cancelled and the next person in row will receive a second chance offer. All sales are final, payment has to be send as a GIFT to the Paypal account mentioned in the confirmation mail, further instuctions concerning shipping will be provided in the same confirmation mail. All Penguins will be send out at the beginning of WEEK 43 (Monday, October 21) which is why the payment term is set at 24hrs. Review: The project started in June 2012 with my commission request and the moment everything was sorted out two Penguins and two Weapons were send out to Mr. Nilla for the mold making. As most of you probably know the Penguin figure is the smallest within the Battle Beasts line so this also results in the fact that its peg-holes and the arms are all quite a bit smaller than delicate than most other Beasts. It soon became clear the casting of this figure was causing some problems so it was definitely not an easy project even for a well skilled and talented artist as Mr. Nilla. Due to his busy schedule, running other projects, and the fact the highest possible quality was requested for these Gumball Penguins the whole process took a while. Where in a normal situation the weapons are casted directly with the figures for this project a separate mold had to be made for the weapons since they were casted in purple. In the end the final Penguins and weapons were casted and cleaned in the beginning of September 2013. 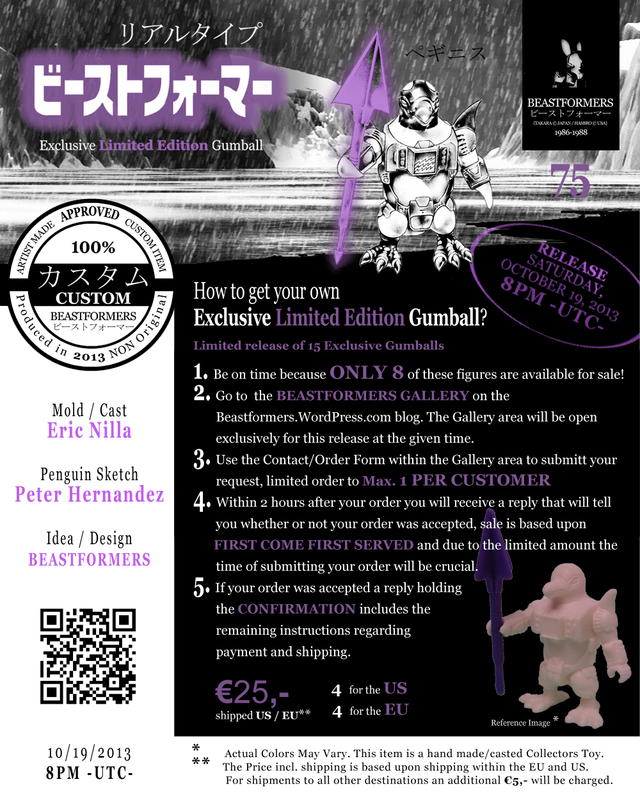 During the finishing period of the figures the header design was started by the Beastformers Team and one of the Sketches Peter Hernandez had already made for the PPA project was used within the design. When both were done the figs were ready to be bagged and sealed. All figures were numbered from 1/15 – 15/15. 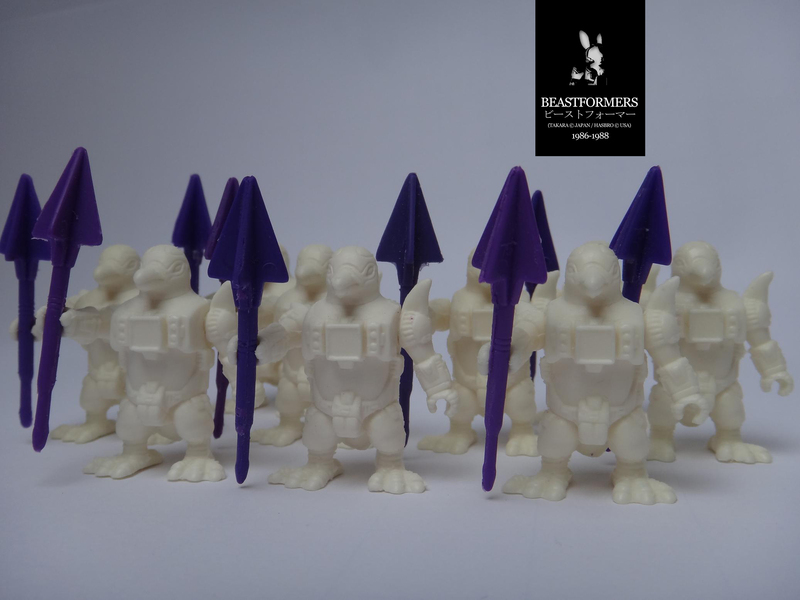 Numbers 1-5 will remain within the Beastformers collection, numbers 6-13 are offered for sale and numbers 14 and 15 were given away to fellow collectors and helpful friends. In the end the whole project was a time spending one but looking at the final result and the high quality of the Gumball Penguin with is colorful Purple weapon it was all more than worth it. * The Price incl. shipping is based upon shipping within the EU and the US. For shipments to all other destinations and additional €5,- is charged.